Successfully Added Futuristic Gears Clock - Black to your Shopping Cart. There's is simply no excuse for having a boring office timepiece when you could get one of these awesome modern gear clocks. 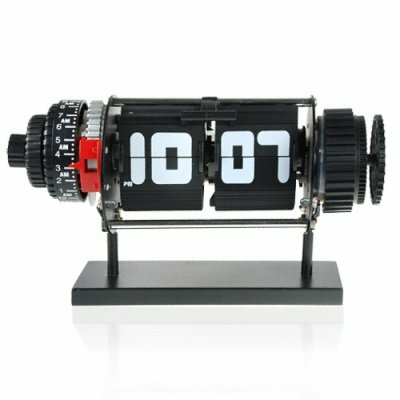 Featuring easy to read flip over numbers, alarm and adjustable lighting for night use, this is quite simply one of the coolest clocks you'll see. The gears on the right hand sign rotate in opposite directions at the same speed to create one of the most interesting ways to watch time ever. Dress your office or bedroom up with style or give as a gift. Each Futuristic Gears Clock is backed by Chinavasion's famous 12 month warranty. Note: Please note the power supply of this product is for use with a supply voltage of 220V, contact customer support if you need a 110V version.